superdumb supervillain: Huge Sale at The Sak! Huge Sale at The Sak! 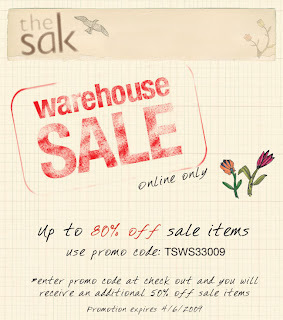 Huge online sale at the sak starts today. Use promo code TSWS33009 at checkout to receive an additional 50% off already incredible prices. Stock up! And go now- the sale is over in a week. Gawd woman, have you no mercy? I'm thinking hubby must be asleep while all this ordering is going on.